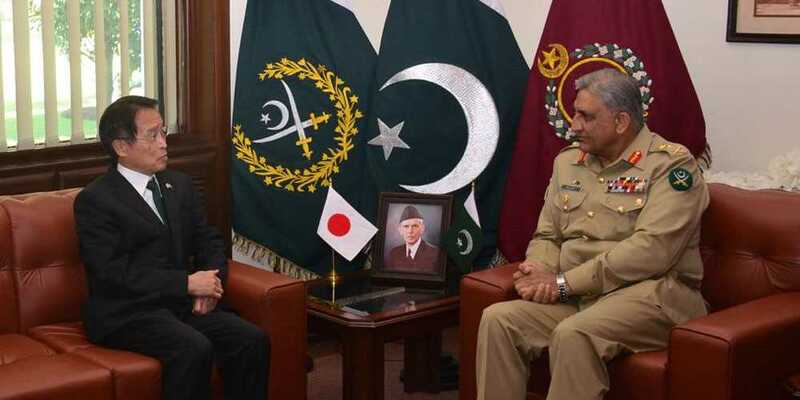 Japanese Ambassador to Pakistan Takashi Kurai on Friday called on Chief of Army Staff (COAS) General Qamar Javed Bajwa at GHQ to bid farewell at the end of his tenure in Pakistan. In a statement issued by the Inter-Services Public Relations (ISPR), matters pertaining to mutual interest came under discussion during the meeting. Speaking on the occasion, the COAS appreciated Japanese Ambassador’s role in strengthening bilateral relations between the two countries. Gen Qamar Bajwa also assured Takashi Kurai of full support for all initiatives aimed at further enhancing the same.